Team: John Rees with Richard Marshall and student Oskar Ciechanski. Halifax RLFC, in partnership with Calderdale College, has officially launched its Under 19s Academy. The new academy will train and play every week to develop players’ rugby skills and study theory to build on their knowledge of sport and fitness. 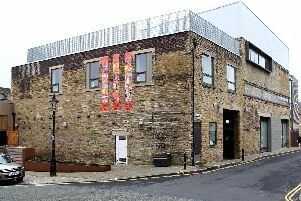 The team will be located at Halifax RLFC’s training base at Calderdale College. John Rees, principal and chief executive of Calderdale College, said: “The new partnership with Halifax RLFC will provide our students with an outstanding sport education programme that gives them the chance to play for their local professional team. Players interested in learning more about the academy are invited to visit the next Open Training Session on Friday, April 26 between 11am and 2pm at the college’s Inspire Centre campus on Francis Street.